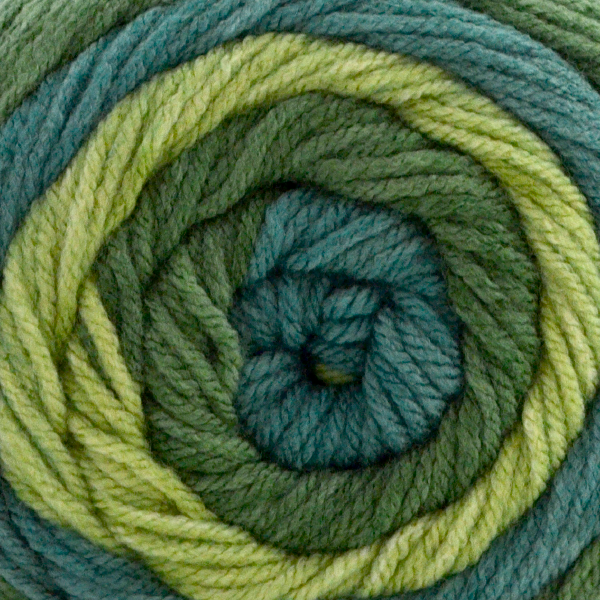 My friends at Premier Yarns asked if I wanted to try out their new Sweet Roll Yarn, so of course I said yes! Each 245-yard Sweet Roll has two complete repeats of three beautiful colors. 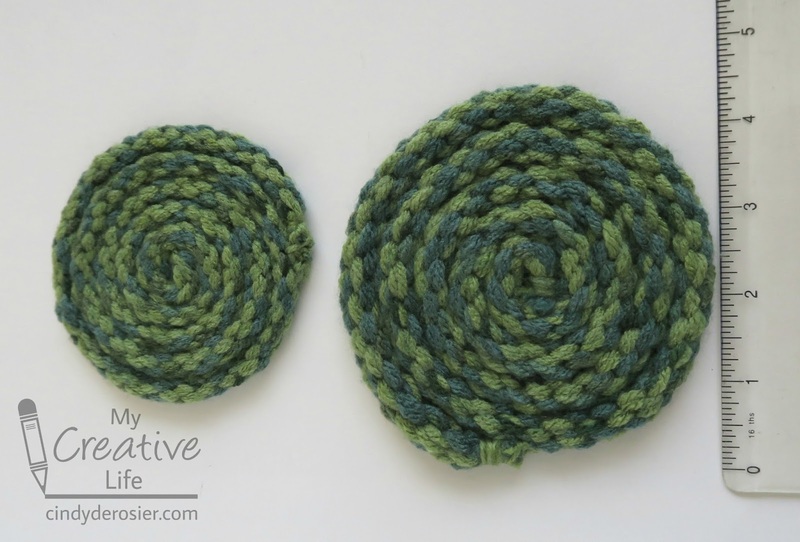 If you use it to knit or crochet, you get wide, evenly spaced stripes. The yarn is 100% acrylic, which means it is machine washable and dryable. 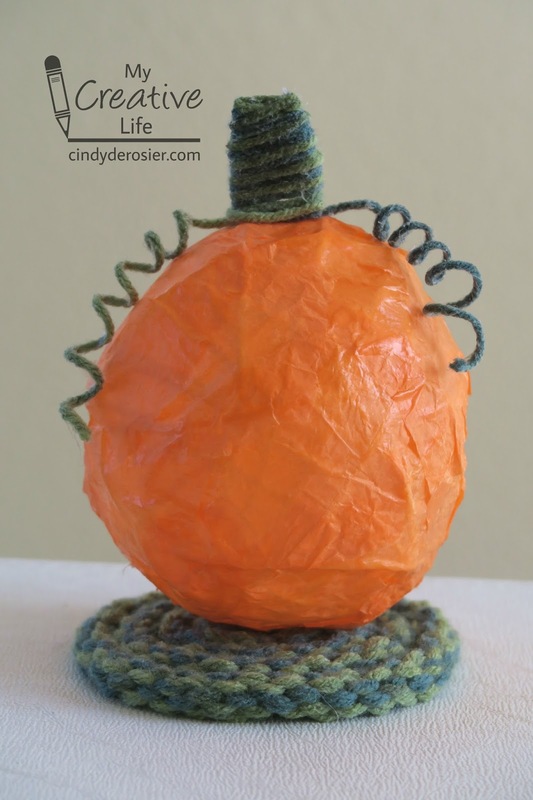 But the best thing about the Sweet Roll is that as you pull the yarn from the center, the ball stays put without rolling around or dropping to the floor. Love that! I made a yarn trivet and a yarn coaster (plus the yarn pumpkin, which I'll share in a separate post). All were made from Premier's "Mint Swirl" Sweet Roll. Isn't it pretty?! When I received the yarn, I already had a knitting project on my loom. So I decided to experiment with what would happen if I tried kumihimo with multiple strands of yarn. 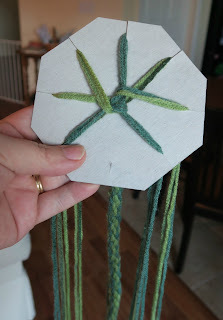 I cut 21 strands of yarn, each around 2 yards long, tied a loose knot in one end, and threaded them onto the kumihimo octagon. I put three strands each in seven slots, leaving the eighth slot empty. Then I started braiding, following these instructions. When I was done, I removed it from the octagon. Rather than tie a knot with all 21 strands, I took one strand, wound it tightly around the other 20 strands about ten times, then knotted it tightly with one of the strands it was wrapped around. Then I cut off the extra lengths of yarn, very close to the knot. I took out the loose knot I'd started with and did the same wrapping and knotting. I didn't cut off those ends, because I wasn't sure if I'd need them intact (as it turns out, no). With my 21-strand braid done, I started a 14-strand braid (two strands instead of three in each of the seven slots). I worked on that one during Trevor's dental appointment. It's the perfect craft to carry around for when you have a few minutes here and there. It fits easily in a purse and you can start and stop at any time without having to get to the end of a row or struggle to figure out where you left off. Here are the two yarn braids. 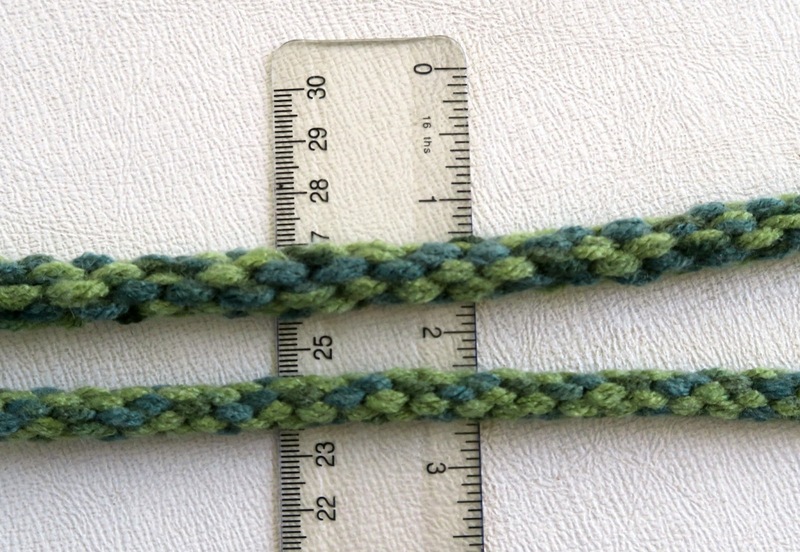 The top one has 21 strands of yarn (3 x 7) and the bottom has 14 (2 x 7). Both braids ended up just under 3 feet long, so approximately half of their starting length. Obviously, that is much too long for a bracelet! 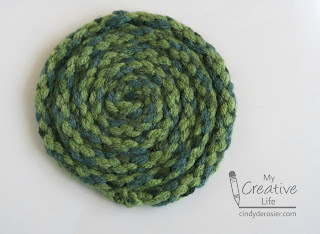 My plan was to coil the braid to create a pretty coaster. I cut a long piece of yarn and threaded it on a yarn needle. And then I started coiling. As I coiled, I used the yarn to attach braid to the growing coil by sliding the needle under one strand of each and pulling tightly. 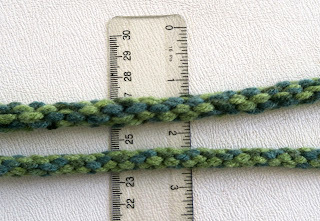 I trimmed off the long ends as close as I could to the knot, then I sewed the end to the coil. 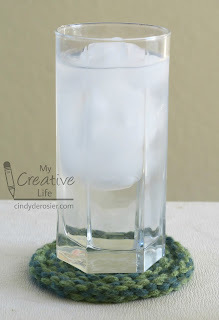 Here are the coaster and the trivet. Each was a nearly 3-foot braid, but because the braids had different thicknesses, they coiled up to form different diameters. There are 25 different colors of Sweet Roll. If you'd like to get your hands on some, use the code CINDY10 to get 10% off any purchase at www.premieryarns.com through October 31, 2016. Ohhhhhhhhh those are fabulous! LOVING the colors!!!!!!!!! !